Could a strong source of light create gravity in the shock wave? In response to Sheldon's comment, I think that the border between black hole and neutron star is fairly narrow and that any intense gravitational field could cause an accreation disk similar to that of a black holes. 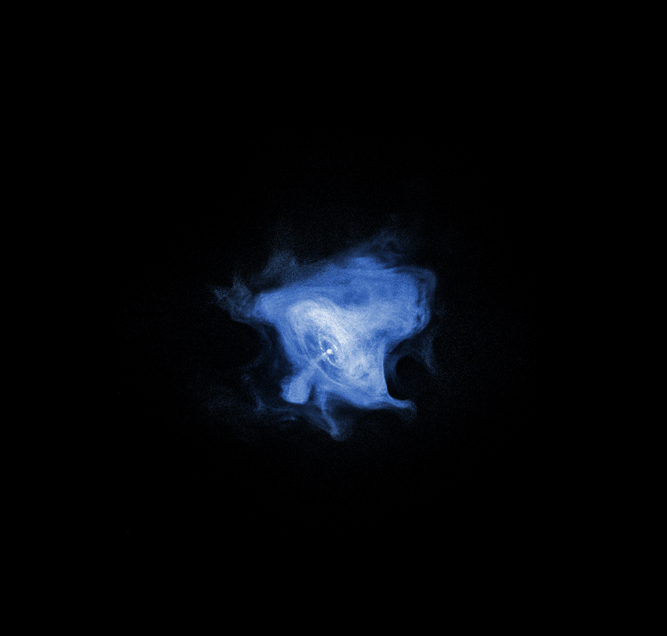 When a white dwarf for example is in a tight orbit around a gas giant, it can pull off gas forming a disk which eventually explodes creating a nova. Beauty is not the word. If it's that old why does it keep on generating energy -is it infinitesimal? I would have to agree with Sheldon on this. This picture more illustrates a black hole. True the energy released from the center could be the still collapsing star. There are many forms a star may have. Maybe a quasar is just a step in the formation of a black hole and maybe sometimes it stabilizes and remains a quasar. People claim to know, but nobody knows for sure. But at this rate someday you'll have one or the other. It is truly breath-taking. It looks awesome. 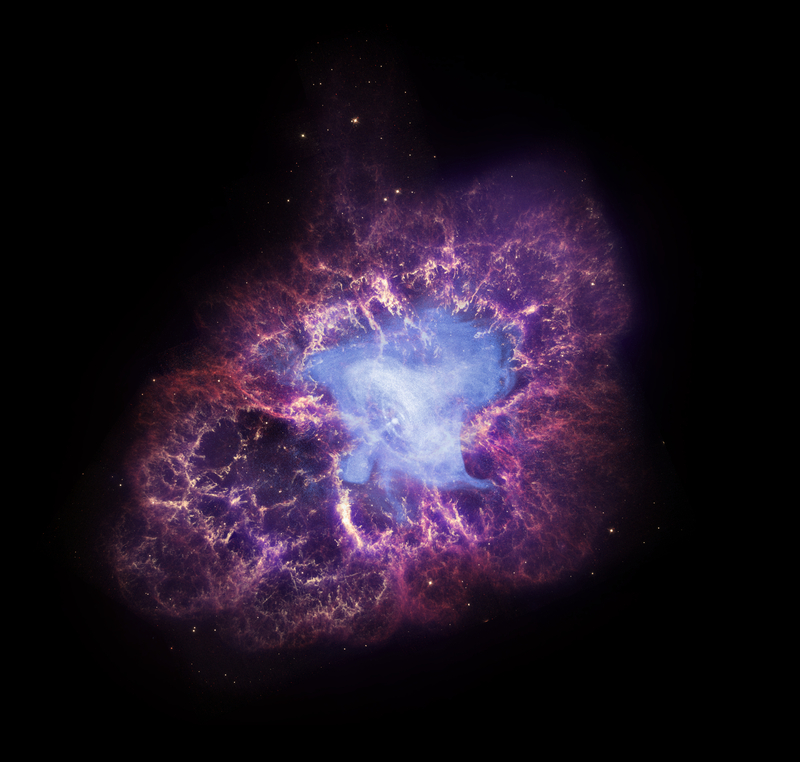 The Crab Nebula has been observed for almost a century now. I wonder, if there are hundreds of observations over the years that could be put into a short video, I would love to see how much it has changed in the last 100 years since it is not even a 1000 years old. Given its close proximity young age and size there should be far more research being done on it. What does spectral analysis show of its elemental structure? What elements are where? How fast is it expanding? 12x8 light years in size in less than 1000 years and what does that say about? How fast is its rate of expansion slowing? Knowledge will set us free. Being able to understand how the energy is produced is a stepping stone on how to make our world a better place without using carbon as fuel. If we can use the energy, then we are truly free to explore the limits of time and space. Truly one of the most beautiful things I have ever seen. This is a very beautiful picture of the Crab. The pulsar in its center is very compact, rotating at nearly 30 revolutions per second. A very interesting stellar object to read about and study. Photo appears to reveal a pinpoint surrounded by a circle disk, with jets emerging from either poles. Isn't this more representative of a black hole than a neutron star? On the other hand, if a black hole, one would expect to see a disk feeding the lurking monster, Can it be that the star is still shrinking, even after a thousand years on its way to becoming a black hole? I wonder how long the Nebular can continue to generate energy at that level? Wow. Not a word most would use, but this is really wonderful to see and learn about. It never ceases to amaze me how much variety is in the stars and planets. Before, I would look and say stars at night wonderful, now, it is Wow. If the Crab Nebula is about 6000 light years from Earth and his explosion was observed on Earth a thousand years before now, those means that it happened 7000 years ago? If we suppose that explosion produced some type of gravitational effect. What effect arrived first to Earth? the light effector or gravitational? About 6,000 light years from Earth. By combining X-ray data from Chandra with optica data from Hubble and infrared data from Spitzer. The Crab is 10 light years across. Blue represents the X-ray observations, red and yellow represent the optical, and purple represents the infrared. In the Zodiac constellation Taurus (the bull), visible from both hemispheres.